More incentive to keep devices out of kids' bedrooms. In 2016, the average kid got their first smartphone when they were 10 years old, according to TechCrunch. That’s likely a much earlier first foray into device-ownership compared to just a few years ago. And a new review of more than five dozen studies published in the journal Pediatrics shows the ways these devices are impacting kids today—namely, the way screens interfere with their sleep. Everyone needs sleep to function, but the younger you are, the more you need. The National Sleep Foundation recommends that kids between 3-5 years old get 10 to 13 hours of sleep per night, children 6-13 years old get 9 to 11 hours of sleep per night, and teenagers between 14-17 get 8 to 10 hours of sleep per night. For the new review, researchers from the University of Colorado, Boulder, looked at more than 60 studies that included participants between 5 and 17 years old, and found that around 30 percent of preschoolers and between 50 to 90 percent of school-aged children and adolescents don’t get as much sleep as they need. Getting good sleep when you’re young is associated with “lower obesity risk, better psychological well-being, improved cognitive functioning and lower risk-taking behaviors,” the researchers write. On the other hand, not getting enough sleep or not sleeping well is linked to poor school performance, daytime tiredness and a variety of psychological problems, according to the review. Here’s a brief overview of their findings. There are three main ways that screens can interfere with kids’ sleep, according to the review. For one, there’s the act of staying up late and actually using the device instead of sleeping. Then, there’s the content on those screens that could be keeping young brains awake (like texting with friends, scrolling through social media or watching television). And lastly, there’s the blue light that devices emit which disrupts our melatonin production, a hormone that promotes sleep. Adults shouldn’t be using screens before bed for similar reasons. But the review authors note that adults may be able to compensate better than kids because they control their own schedules while kids have their wake times and bedtimes determined by parents and school. Seventy percent of children have screen-based media devices, like an iPhone or tablet, in their bedroom, according to the review. The authors point to another recent review of 67 studies looking at the link between screen time and media use in kids. Those researchers reported that 90 percent of those studies found a negative link between screen time and sleep health. Interestingly, watching television was less often to be associated with bad sleep compared to computers, something the researchers suggest may be because it’s less “interactive than computer-based activities.” They also point to data from a study of 454 adolescents that found around 60 percent kept their phones with them when the went to sleep and around 45 percent of them used their phones as an alarm. The researchers note that while most findings support the link between screen use and impaired sleep quality and quantity, there are a few limitations. One is that most studies are observational, so while there’s loads of research that supports the link, most studies can’t prove causation. Another limitation, as is true for many studies, is that a lot of the data is self-reported. In this case, that might mean “the true associations between screen time and sleep may be stronger than reported in most studies,” the authors write in the review. The researchers also note that current research doesn’t account for the impact of screen-impaired sleep on other areas of child development or health. The good news is that there are simple ways to help kids—and adults—sleep better. 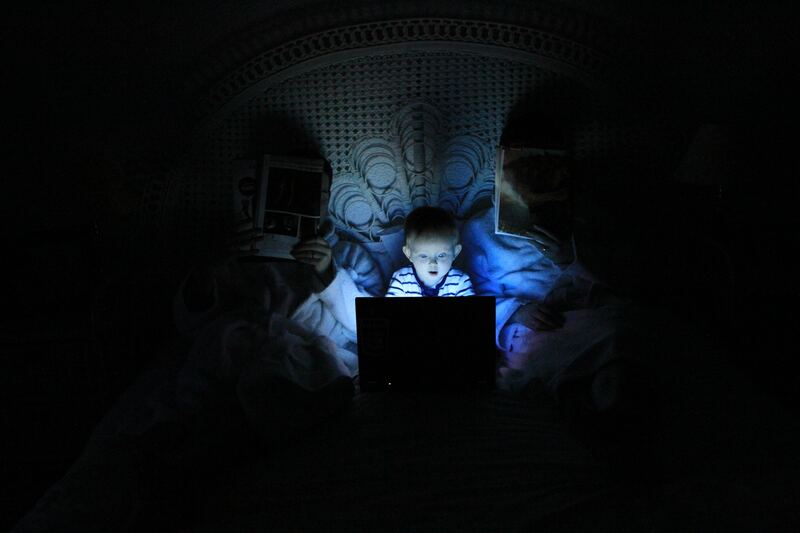 Penn State researchers recently published a paper on digital media and sleep in childhood, also published in Pediatrics. They outline a few main ways that parents and clinicians should try to improve kids’ sleep. The authors recommend prioritizing conversations around sleep and what healthy sleep looks like and keeping all light-emitting devices outside of the bedroom. They also recommend that if a child or adolescent is “exhibiting mood or behavioral problems, consider insufficient sleep as a contributing factor,” according to the paper’s press release.